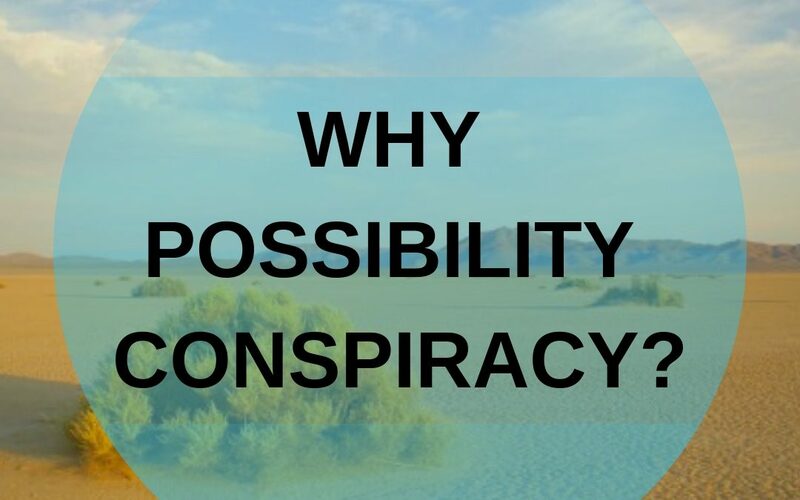 After almost 6 months of writing here on the blog, I’m finally getting around to describing why this thing is called “Possibility Conspiracy” in the first place. And, this week, I’m asking for your help and feedback. I’ve got some questions for you at the end. The short answer is that I believe my work in the world is to help people connect with the possible in their lives. I’m incredibly interested in how we tell a bigger story about what individuals and humanity are capable of. I’m a minister who geeks out on science, and this is what you get when you mix up those parts of my life. Whether it is brain science and physics, or religion and art, this blog exists to reflect on the tools available to tell a bigger and more beautiful story about our lives together, one that isn’t over until our last breath, and maybe longer. This era of science is challenging basic assumptions we’ve had about reality itself. For hundreds of years, the images of a clockwork universe and a clock-maker God were common to scientists and theologians. People like Isaac Newton described a world in which creation was pretty predictable. Apples falling from trees and planets moving through space did what they did because the universe was governed by regular, predictable, and universal laws. If you drop a glass of water, what will happen? The water will fall to the floor, right? What we’re learning from quantum physics (studying energy at the smallest level possible) is that what is happening at the subatomic level inside that water looks way more like chaos than order. It’s the same with the atoms that make up you and me. Recent research suggests that it is impossible to know exactly where the smallest building blocks of creation are until we observe them, that the tiniest pieces of matter could theoretically be in two places at the same time, and two atoms can be “entangled” such that they affect each other miles or galaxies away. Inside each atom is an unpredictable field of chaos and possibility that doesn’t behave like a glass of water falling the floor. Chaos and possibility are built into the very fabric of matter and reality itself. The psychiatrist and mindfulness expert, Dr. Dan Siegel, said that in his work with physicists, they often described energy as “the movement from possibility to actuality.” The math works out, and thank God I don’t have to know how to do it. Basically, every piece of creation at the smallest level arises out a mathematical plane of pure possibility. Why does this matter to you? Because the same possibility that rests at the center of every atom is also buzzing within you. While relatively big things like cars or your limbs might have predictable patterns of movement that Newton would recognize, your thoughts are a different story. According to Dr. Siegel, the workings of our consciousness and mind likely function more like quantum physics than apples falling from trees. That there is chaos in your mind is probably not a big surprise to most people. And for some, the sense that pure presence and awareness feels like a timeless connection with the source of all things probably makes sense, too. As a spiritual leader, seeing “possibility” as one of the names for God isn’t a big stretch here for me. A reality out of which all things arise, exists in all things, remains ultimately mysterious, never leaves us, is the source of all creativity, and holds the future? “God” seems like good enough shorthand to me. We might believe that the matter of the universe is dynamic, evolving, and pregnant with possibility. Our own lives, however, can feel like a different reality altogether. Feeling stuck is such a common human experience. In the moments when our lives feel small and powerless over something, a tangible experience of possibility makes all the difference. Navigating freedom from addiction, inventing something new, making meaning after trauma, finding new love or a life after an old one, being forgiven or forgiving others, living with meaning after loss, taking risks for a new job. The meaning in each of these comes because a person believed a different life was possible and then cooperated with the forces that make it so. 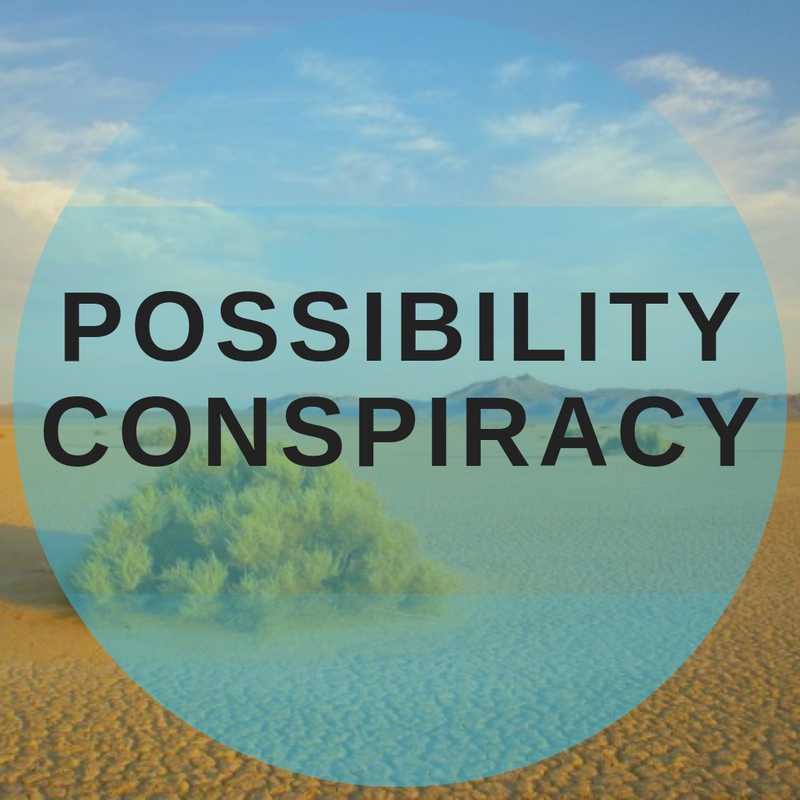 The name “Possibility Conspiracy” points toward people intentionally partnering with the forces that create new life. The word “conspiracy” comes from the Latin “conspirare.” Literally “to breathe together.” This blog is an exploration of how you and I “breathe together” with possibility. What resources help you connect with possibility in your life? Are there practices, teachers, communities, or tools that help you live a bigger identity and find a more abundant life? What topics would you be interested in reading about here on the blog? What kind of people would you like me to reach out to, and what are you interested in learning about together? Theater is where I vibrate. Movies, music, art. These are all places that become church for me. Where I expand, find possibility and communion. Also when I am back home on the farm where I grew up in Louisiana. Roots, the space, the wonderful trees, and a feeling of finding creation that fills me and expands my life. A joy deep, deep inside and a resting place. This is great, Francis. Thanks for sharing!